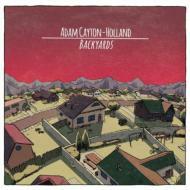 Adam Cayton-Holland (www. adamisfreakingoutrightnow.com) is a national touring headliner who plays all over the country. He was named one of 25 Comics to Watch by Esquire Magazine and has appeared on Conan, The Meltdown with Jonah and Kumail, The Pete Holmes Show and @midnight. He has appeared on ABC's Happy Endings and was featured on the Nerdist, Comedy Bang Bang and Sklarbro County podcasts. Cayton-Holland has also performed at the Montreal Just For Laughs, SXSW, Bridgetown Comedy festivals, and helms his own comedy extravaganza in Denver, The High Plains Comedy Festival. His monthly show and web series The Grawlix is a critically-lauded darling child that you should know and love. The Grawlix crew recently filmed a pilot for TRU TV called Those Who Can't. Adam also has a podcast called, My Dining Room Table, as well as an album, I Don't Know If I Happy, both available on iTunes/Greater Than/Record stores. Boy howdy you should give them a listen! Adam lives with a purebred Chesapeake Retriever named Annabel Lee and people have described him as genial and with pretty decent teeth.